We’re growing rapidly and expanding capabilities, both of which are creating some new career opportunities at Adams & Knight. Our most urgent priorities are highlighted below. If you know of anyone who would like to work for great clients — and with an exceptional team, please send them our way. Who says there’s no such thing as a free lunch? 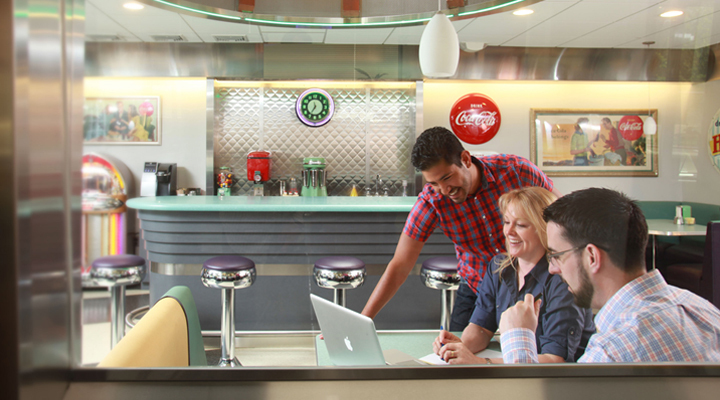 At Adams & Knight, employees can take advantage of a free lunch every day in the agency’s ’50s diner. Why the free lunch? It’s a great way for people from different departments to gather on a regular basis to cross-pollinate ideas…and just to connect. Employees don’t have to stay in for lunch, but most do. And fortunately, there’s a walking trail outside our door to work off these great lunches. The company offers a 401(k) retirement savings plan for eligible employees. Employees can start saving money right away (up to 15% a year). After six months, Adams & Knight will begin matching 50 cents for every $1.00 contributed on the first 8% of salary. Company contributions are subject to a vesting schedule, described in the plan document. Adams & Knight offers its employees a discounted membership to the Healthtrax Fitness Center (located a quarter mile from the office). There is also one of the longest “rails to trails” or walking trail right in back of our office. You can walk, run, Rollerblade or bike for miles, surrounded by the picturesque landscape of Connecticut. Looking for a Sr. Marketing Account Executive to be responsible for the relationship between our agency and its clients as well as manage client needs through direct contact, liaison, and the marshalling of agency resources.